Rising natural gas prices in India have put a strain on India’s urban bus companies. Photo by Meena Kadri. 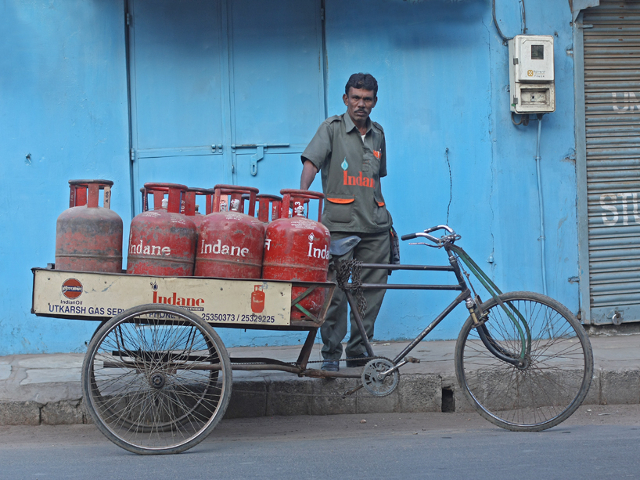 In the Mumbai metropolitan region alone, over 300,000 vehicles run on compressed natural gas (CNG), including 42,000 taxis and about 150,000 auto-rickshaws. On July 1st, Mahanagar Gas Limited (MGL), one of India’s leading natural gas distribution companies, announced a hike in prices for both piped natural gas and compressed natural gas. In Mumbai, prices for CNG have been raised by 2 rupees (3 cents) per kilogram, which is expected to affect the price of transport across the city. For Mumbai’s city bus operator, BEST, the hike will affect 2,300 buses, accounting for over half their fleet. It is estimated that the hike will increase BEST’s expenses by 140 million rupees (2.3 mil USD) annually. BEST has said it is not looking to increase fares, but it is seeking help from the central government to off-set costs. In India, where the urban population is growing fast, transport systems are already under pressure to expand and modernize. India’s urban bus companies are facing a severe shortage of funding for bus modernization as they try to serve the growing population. With these increasing fuel prices adding to the strain, bus companies are looking for ways to save money and curb their losses. One of the best ways for bus providers to decrease expenditures is to increase the fuel efficiency of their vehicles. Fuel efficiency can be improved by making sure drivers have the right driving habits. Fuel efficiency techniques include best practices for acceleration and tips for using gears to control the speed of the bus in addition to the power. Another technique, known as the “power point” technique, involves removing one’s foot from the accelerator a little bit to achieve the power point – that moment when the engine sound becomes smooth but the vehicle has not significantly slowed down – to improve the miles per gallon. Fuel efficiency savings experience in real-life trainings provided by EMBARQ India, have often reached double the number of miles per gallon. The fuel efficiency driving techniques also provide added road safety benefits. If prices continue to rise, it will put a strain on bus companies, but it may also encourage some to use public transport where they previously chose to take their cars.